Yorkshire Chorizo has been unveiled as the latest flavour in Pipers Crisps’ range of tasty, gourmet crisps. All Pipers Crisps’ flavours are sourced from carefully selected, passionate, artisan producers – and their new Chorizo flavour is no exception. It originates from Kirkby Malham, Yorkshire, where specialist farmer and butcher Chris Wildman rears his rare-breed Oxford Sandy & Black pigs and creates unique Yorkshire Charcuterie in the on-site butchery. Chris takes up the story. 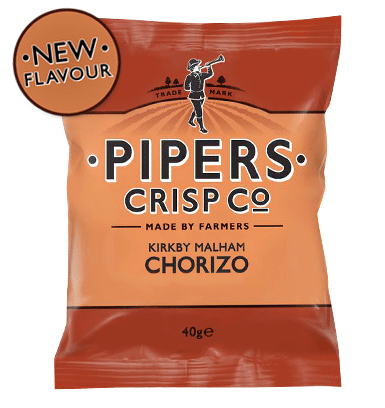 “We were delighted when Pipers Crisps first suggested that our Chorizo would make an ideal flavour for them. Their award-winning crisps are renowned not only for their excellent taste, but also for the provenance of their flavours. They had been looking for a meat flavour for some time and they decided that our Chorizo would be the perfect taste for their crisps – a distinctive, strong flavour without being too salty,” he adds.